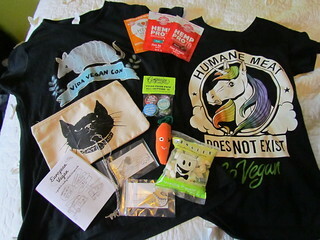 USA 2015 Part 2: VidaVeganCon Kicks Off! Thursday afternoon was the Unofficial (But Official) VVC Meet & Greet at Buzz Mill for those who were in town early. I can't deny that I was pretty nervous, being a social awkward person plunging into an outdoor patio full of people who mostly already knew others there. But turns out I didn't need to worry, because everyone is lovely! 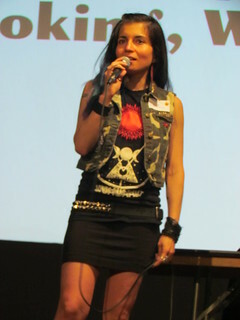 I was welcomed by Jess, one of the amazing VVC organisers (who made me feel so welcome the entire weekend). I was so excited to finally meet Jojo from Vegan In Brighton (who I have followed in the internet since way back when I used to frequent the PPK) as well as fellow Australian (but living in Germany) Josh. I also met Randi from Laughfrodesiac and Lauren. 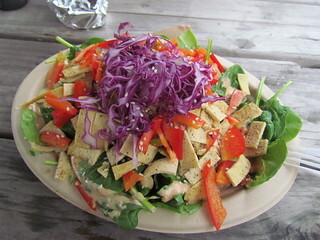 Buzz Mill had a vegan food cart out the back, Golden Spike Rail Cart, which is now operating as a wholesale business rather than a cart. However on the day they were still open and had a fun menu. I was still pretty full, but I had this Mini Cheese Steak (minus the capsicum) which was pretty yummy even though it was not very photogenic! I've been a huge fan of Bianca from Vegan Crunk and finally got brave enough to say hi. She also had her best friend Sheridan with her, and we had met online through Bianca's blog, so that was such a great delight to meet her as well as Bianca! Austin is home to an amazing vegan ice cream shop, Sweet Ritual, and they were selling a couple of flavours there. 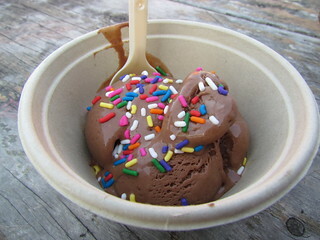 It was hot, and also who says no to ice cream, so I got a scoop of the chocolate (almond-based) with sprinkles. After the meet and greet I ended up at in.gredients for trivia with Jojo and crew. I was on a team with Josh, Erika (who I worked out used to do the Cosmopolitan Hour podcasts, which I loved! 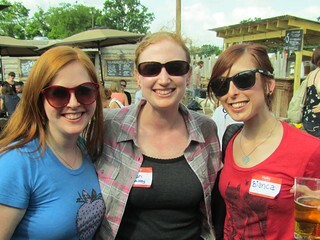 ), Terry Hope Romero and Marie and Dan from Red Hot Vegans (who also organised the VVC scavenger hunt). Our team (Ovulation Nation) came fifth! In.gredients have vegan mac and cheese, but by the time I was feeling hungry they had sold out! 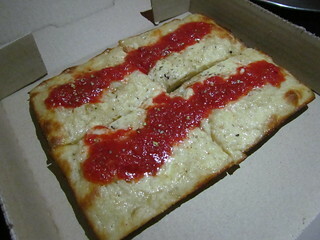 Not to worry, because we headed over to Via 313 food truck where I got to tick off one of my 'must eats', the Detroit-style cheese pizza (made with vegan cheese). This was so good! As I was not traveling with a partner, I ate this entire thing and it was GLORIOUS! The next morning was the day of the Vegan Bazaar, and I wanted to make sure that I didn't fill up on breakfast too much. 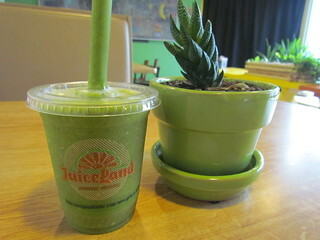 So I went to JuiceLand (I went to the Guadalupe location, they have several) and had a Peachy Keen smoothie, which had apple juice, peach, spinach and kale in it. It was great, and judging from Instragram was a popular smoothie among VVC attendees! On my way back I stopped off at Wheatsville for the second part of my small breakfast. 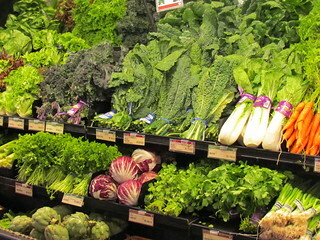 Just take a moment to admire this portion of their produce section. Greens are so pretty! I picked up a chai latte (the JuiceLand ones had both honey and coconut oil in them... WHY???) 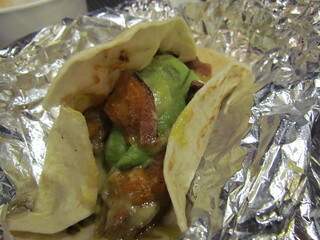 and a breakfast taco (while in Austin). I also grabbed this cute oatmeal cup to stash for Indianapolis (more on that after Austin) and a mini-cheese just because. The taco had black beans, potato and 'beef mince', and ended up being a lot spicier than I anticipated. But thankfully I had some Maple Pecan Malk in the fridge to cool me down. And then it was on a bus and off the the Bazaar! The first hour was a cheese tasting put on by none other than cheese queen Miyoko Schinner! We can get three flavours of her cheese in Australia, but unfortunately they are all quite heavy on the coconut oil, so I was stoked to be able to try the other flavours! 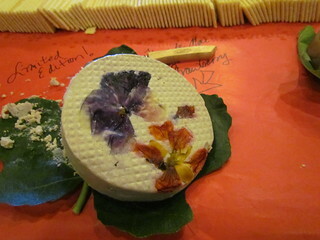 My favourites were the Mt Vesuvius Black Ash and the Aged English Smoked Farmhouse (I love all smoky cheeses). I didn't get a good photo of the cheese laid out on the tables, but here is my plate! There was also a limited edition flavour, this gorgeous Fleur de Mai Sweet Cream Strawberry. The flavour of this was incredible! I wasn't sure if this had coconut oil in it (I suspected it did as her softer cheeses tend to) so I only had a little bit but it was so good. Plus, pretty! The Bazaar itself was pretty amazing. A lot of great vendors and so many samples! 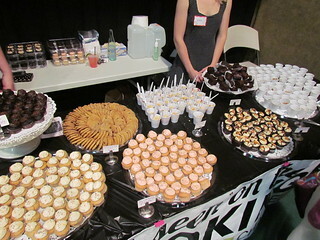 Capital City Bakery was there with an entire table full of free samples! I had a cherry pie in a cup, a strawberry blonde cupcake and a chocolate chip cookie. 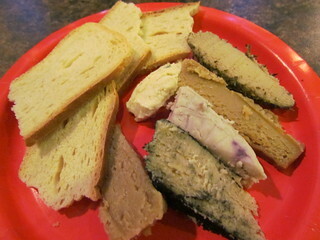 I also finally got to sample a lot of Treeline Cheese which is incredible, the scallion one was my favourite. Other vendors there that I enjoyed samples from included Mean Vegan Products (my first ever tamale tasting, also they make some great mushroom jerky) and Upton's Naturals (their new jackfruit products are great!). But there were so many more as well! The bazaar also had some talks going on. After the crowded vendor area, sitting in a peaceful theater was a nice break. 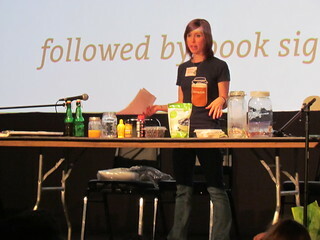 I went to Bianca's Kombucha and Ginger Beer Home Brewing talk, the 'How We Made Austin Awesome' Panel (CLICK ON THAT LINK!) and also Terry Hope Romero's guide to the internet. I happened to bump into Anika from Vegan Score, Seattle Vegan Extraordinaire! I had not had a chance to meet her on my past Seattle trips, so this was Very Awesome (everything is awesome!). She also introduced me to two other Seattle vegans, Brit and Jean. Hanging out with awesome Seattle people just made my day! 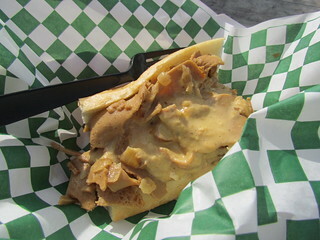 There were four food trucks that came to the event, and I sampled from two. 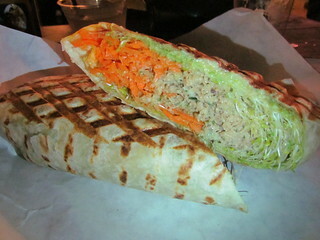 Of course I could not miss out on a taco from The Vegan Nom. They have a HUGE menu as well as specials, but I ended up going with the intriguing Maple Miso Sweet Potato, which had maple-miso glazed sweet potato, creamy salsa verde, coriander and avocado (I had them leave off the raw red onion). It was so good. 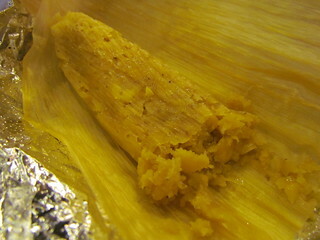 I also had a sweet corn tamale from Cool Beans. Forgive the terrible photo, but this was great! I was sad not to try and of their tacos, which I hear are amazing. My Bazaar haul. I want to go back and buy so much more stuff! For dinner I met up with the Seattle vegans at Spider House, there was some sort of event on there but it got a but confusing so we just ended up sitting and eating and talking. 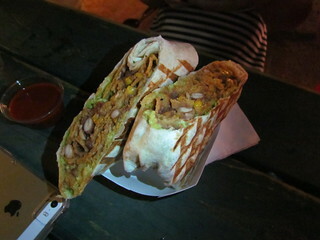 I got the Mock Chicken Wrap from The Vegan Yacht and Brit got their famous Frito Burrito. 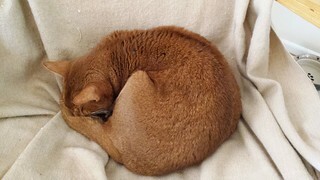 Sahara sleeping the morning before I left. Hello hello hello! I got home a few days ago from a magnificent trip to the US, and I have so much to share! Technically I was going to the US for a vet conference in Indianapolis, however in a blissful coincidence the weekend before the conference was the weekend of VidaVeganCon in Austin, and so my trip begins! I flew to the US with Hawaiian Airlines, as I have done for my past two trips as well. The Tuesday night flight left late, and was delayed a little, so even though I had dinner at home I grabbed a quick snack at the airport before getting on the plane. Since last year, a few vegan friendly options have appeared at the Brisbane Internation Airport, which is pretty exciting (though still a long way to go). Before security there is now a MadMex and a cafe called Botanical Place. 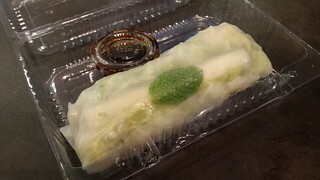 Though security, I got this vegetarian rice paper roll (make sure to ask for plain soy sauce for dipping) from TukChop and a small chips from Burger Urge. There is always the ubiquitous Subway as well. While Hawaiian Air does provide food, it doesn't cater to vegans. It was a 9.5 hour overnight flight (I managed to snag a whole four-seater to myself and got to actually lie down on a plane for the first time ever! 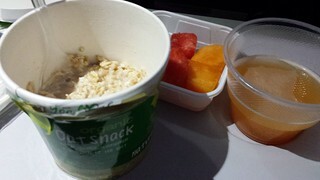 ), and when I woke up I asked them to put some hot water in my Organic Oat Snack to go with the fruit I got from them and the delicious orange/guava/passionfruit juice Hawaiian Air provides. After arriving in Honolulu airport I had three hours until my next flight and I was hungry. There is a small California Pizza Kitchen in one of the food courts. 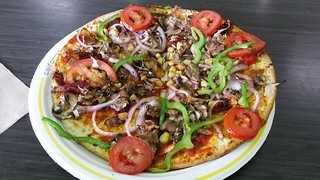 Their veggie pizza is vegan without the cheese. I picked off all that capsicum and then it was great. 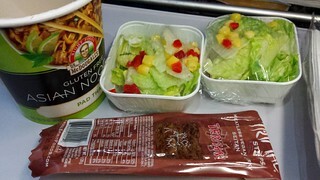 I had a 5 hour flight to LA, and my dinner was a McDougall's Pad Thai noodles, a teriyaki primal strip and about five of those little salad boxes (the attendant kept bringing me more and more, capsicum was picked off of course). I also had a chocolate berry snack bar. I got in to LA late and had to be back at the airport early, so I went straight to my hotel. 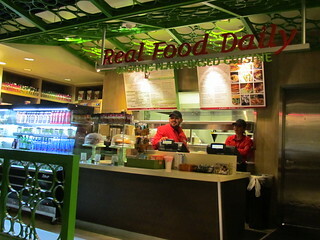 The reason I picked LA for my second stop over was that there is a Real Food Daily at LAX! It is tucked away in a food court of Terminal 4. it doesn't have the full menu of the regular stores, but it has some tasty treats including sandwiches, wraps, burritos, salads, nachos, soup, bowls and baked goods. Drink-wise they didn't seem to offer any milkshakes or smoothies, only very expensive bottles of smoothies and juices. 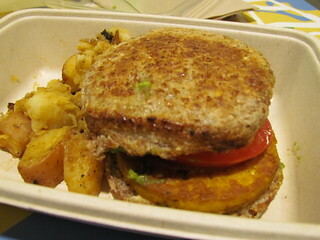 To break my fast I had the RFD Breakfast Sammich, which was an English muffin with marinated tofu, tempeh bacon, swiss cheese, mayo, avocado and tomato, with a side of home fries. This was pretty tasty but a bit on the small side if you are hungry for breakfast. I also got some food to take on the plane for lunch. 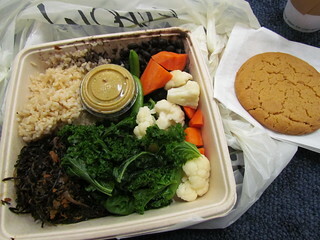 I got the Real Food Meal Bowl (brown rice, black beans, kale, vegetables and seaweed) with peanut sauce and a peanut butter cookie. The bowl was very satisfying, I especially liked the seaweed. I landed in Austin and caught a shuttle to my adorable little AirBnB mini-cabin, and then immediately set out to find some food. I didn't have a car, so I was looking for something in easy (within 30 minutes) walking distance from my place. I ended up at The Steeping Room, which is a lovely tea house with a great vegan-friendly menu. 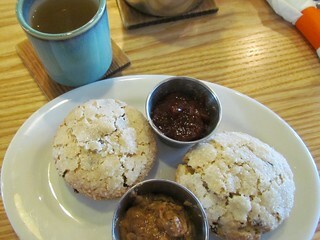 It was happy hour, so I got the Vegan Scone set, which came with the most amazing maple butter (so so so good) and some strawberry jam. It also came with tea, and they have a huge selection! I chose a Mandarin Citrus White tea, which was great. The scones were yummy, though not technically what I would consider a scone. Did I mention the maple butter was amazing? For dinner I met up with Kelly Peloza, my first in-person meeting for the week! 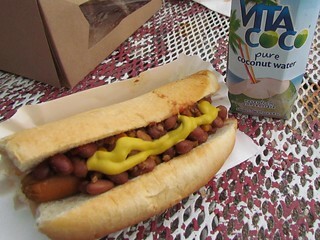 We went to The Vegan Yacht and both had their Chilli Dog and a free coconut water. The chilli dog was nice, though quite salty. I am happy to report that the chilli was very mild, which suited my preferences just perfectly. Wheatsville Co-op (the Guadalupe location) was near my AirBnB so I stopped by to pick up some snacks. 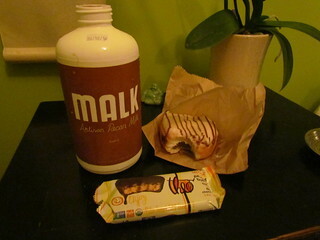 The Maple Pecan Malk is made by a local company and is one of the greatest things I have ever had! I also had an Austin Cream Doughnut from Red Rabbit Bakery, which was filled with a chocolate cream. 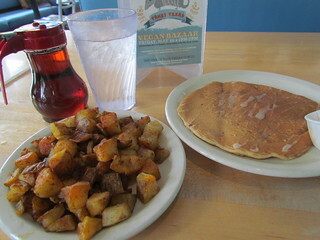 The next morning I went to Kerbey Lane Cafe to check out the pancakes I had heard so much about. The vegan pancake of the day was Orange Spice, and it comes with some vegan butter and lots of maple syrup. It was a great pancake! I also got some home fries because potatoes are important. 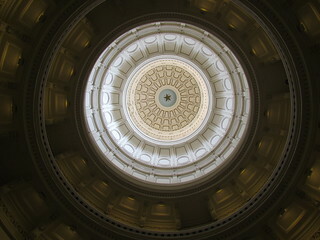 After breakfast I walked down to the Texas State Capitol Building, which had free wifi and was quite pretty. 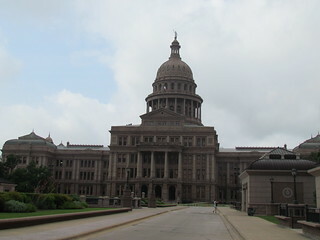 I also learned that Texas was a Republic for a short period! 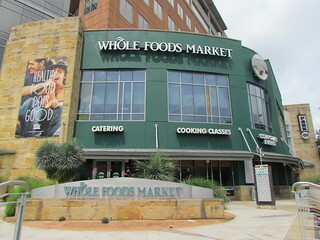 No trip to Austin could be complete without a trip to the flagship Wholefoods. This places was HUGE! It was quite warm outside and there was a lot in there to explore, so I visited the juice bar and got a Minty Melon Smoothie, which had watermelon, mango, coconut water, lime and mint. YUM! I then walked again (lots of walking!) down to Unity Vegan Kitchen, where they were having a 'Chicken' and Waffles special for VVC. I needed something lighter, so I got this stunning Sesame Salad with quinoa, spinach, garlic tofu, purple cabbage and peanut dressing. And capsicum, which I removed. 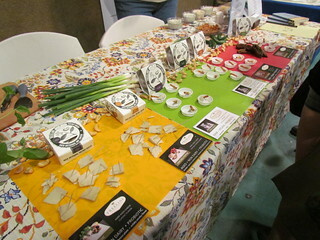 I shared a table and met two fellow VVC attendees - Demetrius from Vegucated and Dan from More Than Salad. 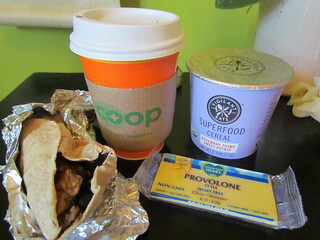 After lunch we went back to Wholefoods, then took a trip to Cornucopia Popcorn to sample some of their vegan flavours. My next post will see the VidaVeganCon fun officially kicking off! The hardest thing about leaving home is leaving my babies. 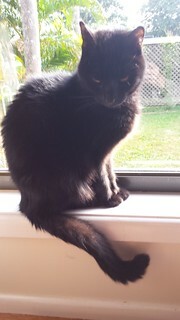 This is the photo of Dim Sim I took on the day that I left.